Chevron markings and other safety line markings form part of your commitment to health and safety, whether that means identifying no-entry zones, pedestrian walkways and crossings, or highlighting possible slip, trip and fall hazards. So it makes sense to work with a safe accredited contractor like TopMark Solutions to carry out any such work to a high standard, not only ensuring safety during the work itself, but also to make sure your new chevron markings have the desired effect. We hold several important safety accreditations, including CHAS and Safe Contractor approval, our teams are fully equipped with the right PPE for the job, and we always carry out full site-specific risk assessments and COSHH assessments before starting work. One recent example of our health and safety line marking work involved highlighting the edges of an MOT inspection pit for Mercedes. 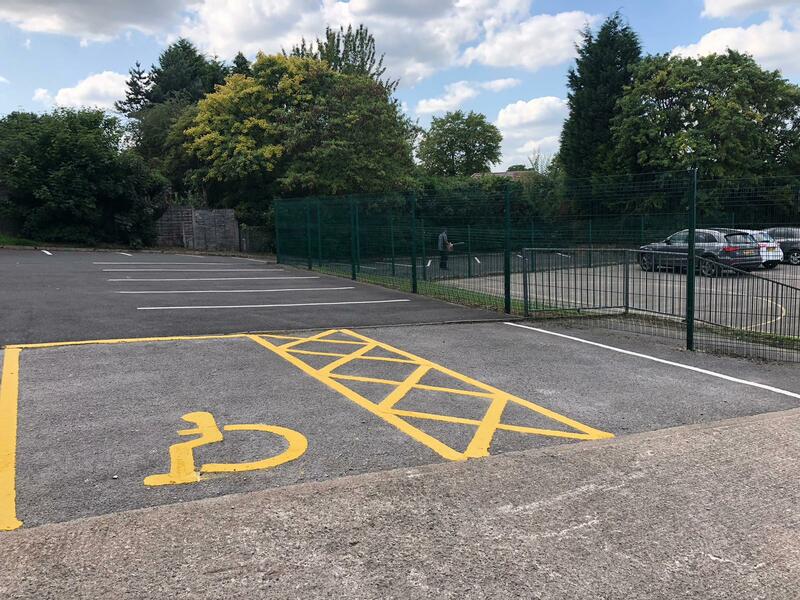 We applied durable safety line markings around the edge of the pit and chevron markings to identify the at-risk areas – similar to the thermoplastic line markings you see in car parks and the fluorescent chevron markings around disabled bays and in no parking zones. As registered and certified ISO 9001:2015 suppliers, all of our customers benefit from the peace of mind that we adhere to rigorous quality management systems, delivering the same high standards on every job we carry out. In another completely different project, we were hired to mark out crossing points for pedestrians, in a much more public environment, with a very different risk, but still an important health and safety precaution. Crossing points help by showing pedestrians where to cross a line of traffic, as well as signalling to drivers that they should consider giving way to people on foot so they can cross safely – getting everyone to their destination with less drama in locations where it is impossible to fully segregate vehicles from foot traffic. Again, we carry out car park crossing point painting to the same consistently high standards, with hot pour and thermoplastic paints that remain visible and durable in exposed outdoor locations for a long time to come. TopMark Solutions’ safety accredited contractors are available for hire to mark car parking bays, one-way systems, no parking areas and special bays like disabled parking, mother and baby, and reserved spaces. We can also paint crossing points, no entry chevron zones and so on – and we’re happy to take on bespoke line marking orders if you need something specific too.